Description: Mosaic had a long-running paper newsletter of which I took over editorship when I came on board. 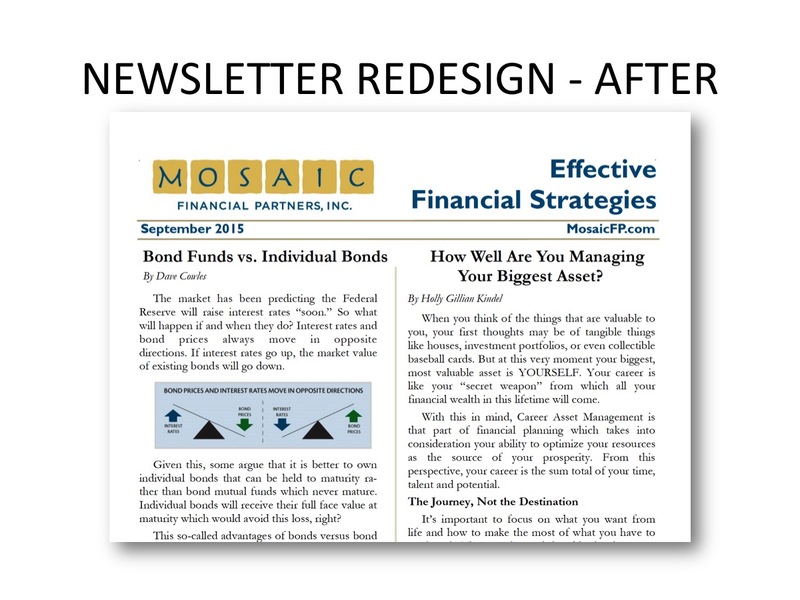 Even though many of the advisors and financial planners contributed articles to the newsletter, the format did not make it possible for them to be recognized for their thought leadership. As part of a broader rebranding effort, I redesigned the layout of the newsletter so that more contributions could be made each quarter and each contributor could be recognized, updated the branding, and purged the mailing list of out-of-date and incorrect addresses. Articles were also repurposed for use in the newly-launched blog. Deliverables: Newsletter template in MS Publisher, editorial calendar for coordination with blog publishing cycle.